The experience as the first student to register for the academic session of 2000/2001 at the Islamic University College of Malaysia (KUIM), now known as Universiti Sains Islam Malaysia (USIM), came with sweet memories to cherish for the ex-student from the Faculty of Quranic and Sunnah Studies, Siti Noorhasmanawiza Mohd Wi, aged 39. She has now established a career as a teacher, a long held dream since her schooldays, to spread the knowledge that she gained for it to be shared to mutually benefit the nation’s children. Q1 Briefly tell us about your background and previous studies at KUIM. I hail from Kota Bharu, Kelantan and am the eldest child. My father is a trader and my mother is a full-time housewife. I received early education at Sekolah Menengah Mahaad Amir Indera Petra before pursuing a higher education in the Quranic and Sunnah Studies Program at the Islamic University College of Malaysia (KUIM) or Universiti Sains Islam Malaysia (USIM) from 2000 to 2003. It never occurred to me that I would be the Number 1 student of KUIM@USIM when I registered. Alhamdulillah, I am blessed to be the Alumni of KUIM@USIM and also proud of what USIM has now accomplished as compared to the early days of its establishment, back in the year 2000. Q2 Why did you choose teaching as a profession and what are the benefits of this field? To me, a teacher is anyone who teaches even the smallest branches of knowledge. When I became a teacher, I think I can focus completely on matters related to the field of Education. Until today, I still remember the advice of my former teacher when I was in Standard 6 which is, ‘it takes effort to climb the ladder of success’. I believe that as a human being, we must have the aspiration to succeed, and to achieve it we have to put in the effort as success does not come easily. My passion for giving and sharing knowledge has made me interested in choosing this field of education. Q3 How did the knowledge and experience of studies at KUIM@USIM help you in your career as a teacher? Upon graduating from KUIM@USIM, I attended the Post-Graduate Teaching Course (KPLI) and was assigned to Sekolah Kebangsaan Seksyen 6, Kota Damansara for 12 years before finally being transferred to Sekolah Kebangsaan Dato’ Hashim 2, Kota Bharu, Kelantan. I can honestly say that the experience of being a student at KUIM@USIM greatly taught me the value of education in molding human capital. This is because at KUIM@USIM, there are both theoretical and practical exposures to knowledge. This helped me in the process of teaching and learning at school. Coincidentally, KUIM@USIM also cares about the aspect of being courteous while seeking knowledge and this also facilitated me in managing the behaviour and mannerisms of students. What is important is that I am grateful that KUIM@USIM has opened up its doors for me to build my own potential in order to finally contribute to the nation’s children, my religion and the country itself. Q4 What are the challenges and obstacles that you faced in your career as a teacher? I observe that the challenges of teachers nowadays are very different than those in the past. This is due to technology sophistication, especially information technology that requires teachers to change as well. This is vital given that should teachers be left behind in this aspect, they will not be able to effectively master the process of teaching and learning. Accordingly, teachers need to remain steadfast because the task of educating a human being is time-consuming. Therefore, the cooperation among teachers, school management, parents, the District Education Department, the State Education Department and the Ministry of Education is very important. Respect for one another is also a virtue that needs to be embedded in all our hearts. Q5 What are your future expectations and aspirations? As Muslims, we must place Allah as the ultimate goal in everything that we do. Additionally, when we perform a task because of Allah, He will always guide us in moments of distress. So that is why my hopes and dreams for the future is being capable of providing beneficial knowledge and spreading the infinite and everlasting knowledge of God. Q6 Your advice to undergraduates who wish to pursue teaching as a career. I urge present USIM students to find a balance between worldly and ukhrawi needs as USIM students act as models to students of religious studies. 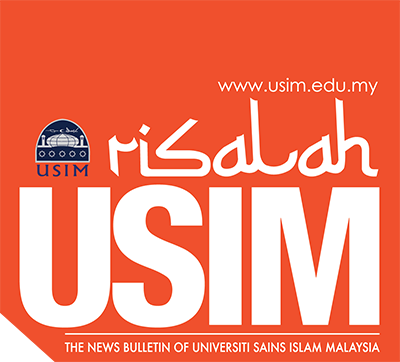 Hence, it is the responsibility of USIM students to uphold the University’s reputation in order for USIM to be more recognised and respected across the world in the near future. I would also like to thank the Government of Malaysia who took the right approach in setting up KUIM@USIM to help students of religious studies in acquiring the best Higher education here in Malaysia. Not forgetting the pioneer staff of KUIM@USIM for their great sacrifices and noble deeds in educating us to achieve our current successes.